Most folks can probably agree that a Lamborghini can pull off outrageous looks better than almost any other car. Yes, there are those that prefer a sensible looking Lambo with mature colors. Even so, a Lamborghini of any kind is never under the radar. Then, there are those who like their Lambo even louder. This is the Daily Driven Exotics Lamborghini Huracan. The car is owned by Damon Fryer. Damon is the type that likes his supercars turned up to 11. After all, his claim to fame is to do things with supercars that most supercar owners won’t. Like say, take the car on a snowboarding trip… including installing tire chains on the thing. It doesn’t stop there. Roof racks and a cargo box are in the plans as well. Just like the rendering below. But let’s back track a little bit to look further into this car. Damon had a Ferrari 458 with a similar theme. The car saw an early demise. After the Ferrari was history, Damon vowed to build an even cooler ride. The task of designing it went to Kyle Isbell of KI Studios at Protective Film Solutions San Diego. After the design was completed, the files went over to our headquarters in Santa Ana, California. There we printed the full wrap and performed the installation. 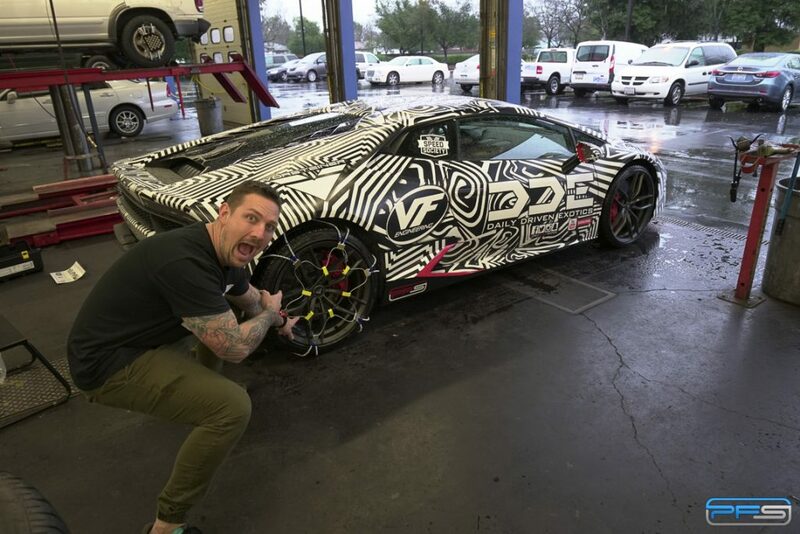 The reveal of the Daily Driven Exotics Lamborghini Huracan was done at a Speed Society event. 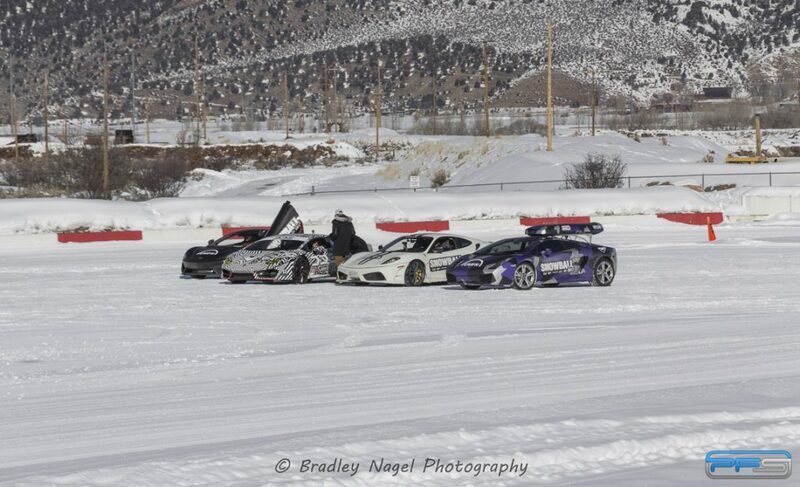 Needless to say, the car wowed everyone who was lucky enough to attend the event. We don’t have to go into too much detail to describe the design. You can see for yourself that it encompasses a monochromatic theme. Yet while being only black and white, it’s as bold as they get. A pattern like this is hard to pull off. Designing it to work and look right is not an easy task. A hint of color was added with some small red accents along the front and side intakes. The final touch were the yellow motorsport-inspired headlights. The first test of valor for this very cool Huracan was the Snowball Rally. In it, the car saw quite of bit of snow driving. 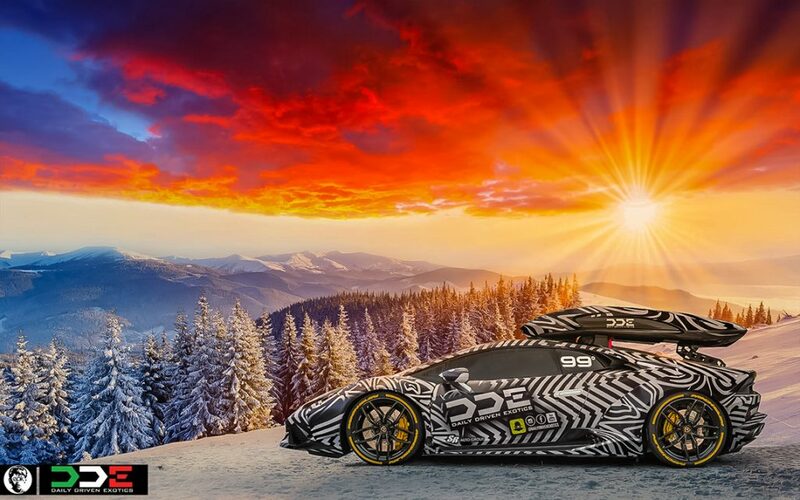 Snow chains on a Lamborghini? If you’d like to know more about the road that lead to this Lamborghini, as well what it takes to daily drive an exotic, make sure to check out Damon’s YouTube channel Daily Driven Exotics.